@mtarpy please see the post here regarding this issue. If you are still experiencing issues, we recommend you contact Webroot's support team at 1-866-254-8400 or by submitting a ticket. It looks like I made the right call to turn off auto updates on end points on PC's. I had turned them off on servers after an update took down a server. We now no longer allow them due to problematic update releases from Webroot. I would suggesst that you do the same. At least until there have been no reported issues with the "new" release. I have a client with 50 PCs running Webroot - 10 are reporting application issues and errors - the only commonality that I've been able to find between the 10 is that they are currently on this update - have there been reported issues with the new version? If so what is the process for rolling back? This is just one site out of roughly 50 that I'm talking about here - there are hundreds of computers potentially affected. I'm starting to get the feeling that this is going to be a long night. 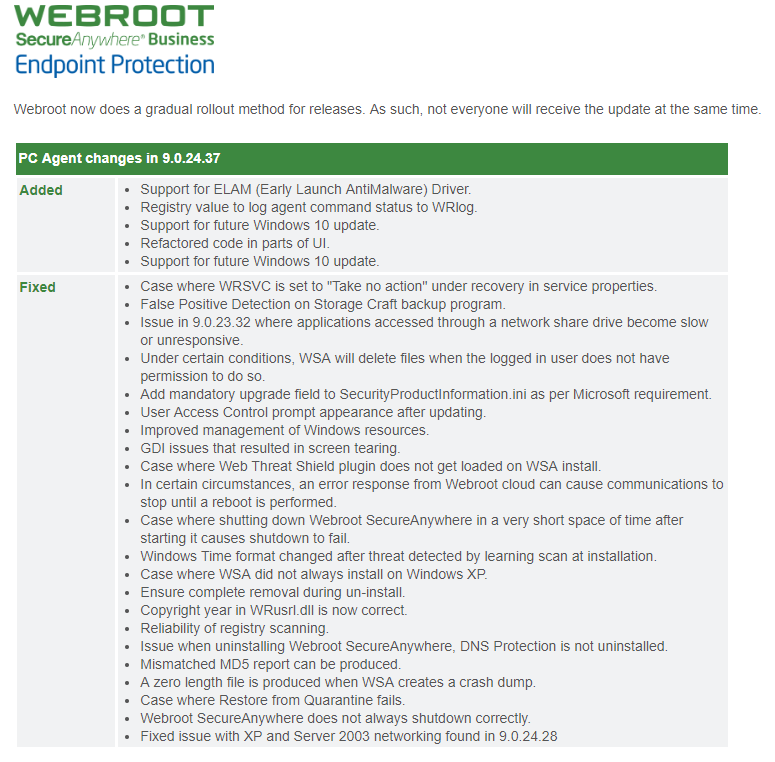 Thank you Webroot for changing to a gradual rollout method! Lots of fixes, very nice! Wow, still supporting XP and 2003. Not every company goes out of their way to support their customers like that.